If you wait for inspiration to strike before you start writing, you might never put pen to paper or fingers to keys. That’s where writing prompts can help. Since I write scifi and fantasy, I’ve put together a list of 25 fantasy writing prompts to get you started. These are various ideas that have been bouncing around in my head or taking up space in my notebooks. Some are just quotes—a few even borrowed from a few of my favorite shows—while others are more elaborate prompts. They’re mostly contemporary fantasy ideas: supernatural, magic, vampires, stuff like that. How you use these are up to you. You can sit down, pick a prompt and free write for 10 or 20 minutes, or they can even become the basis for a full-blown short story or novel. NaNoWriMo is coming up soon, right? Maybe one of these will carry you for 50,000 words? A working-dad desperate for money to feed his family turns to robbery, only to find that he’s chosen a wizard as his victim. A man comes home from work one evening to find that his couch is missing. Where did it go? A woman receives an anonymous package that contains only a shiny stone and a note with the address of a nearby, infamous landmark. During an excavation, an archeologist stumbles on what he believes are the 30 pieces of silver paid to Judas to betray Jesus. After falling asleep during history class, a teen wakes up to find his school and town apparently abandoned, for what looks like years. A man uses his hypnotic eyes to rob the rich and then give to the poor. A group of hikers discover what appears to be the stone tablets Moses recorded the Ten Commandments on. After the first snowfall of a year, a man who lives alone in the woods sees a giant set of footprints leading up to his barn. The president’s son discovers ghosts that inhabit the White House, and they’ve got a message for him. A royal family in Medieval times bunkers down for the storm of the century that they believed was conjured by their enemies. A group of Faeries accidentally make the inhabitants of a small Appalachian town fall in love with each other. A sorcerer and his daughter are stranded on a desert island, and then a second shipwreck brings a surprise visitor. Two husband and wife chemists quit their high paying jobs on a quest to develop the Sorcerer’s Stone. A young man must take over his ailing father’s business—raising dragons that they sell to the world’s wealthiest as pets. Out catching fireflies on their family’s farm on a hot summer evening, two little girls accidentally capture a fairy instead. Every night, a man hears music behind his house. When he finally investigates, he discovers a circus in the middle of nowhere that disappears each morning. A teen usher at an arthouse movie theater finds himself trapped in a 1920s vampire movie. A pathologist accidentally unleashes a virus that turns those infected into sniveling, snarling dogs with razor sharp claws. Waiting for the subway, a woman strikes up a conversation with a man who claims to be Jesus. The weird thing is it seems he’s not lying. Home from the airport after a long trip, you realize you have the wrong suitcase. What you find inside, however, leads you to believe the bag’s real owner might be a witch with a mean streak. 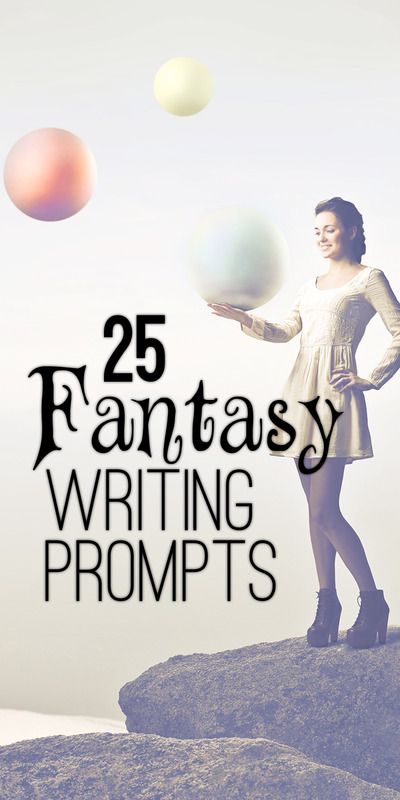 25 Fantasy Writing Prompts by Justin McLachlan is licensed under a Creative Commons Attribution-ShareAlike 3.0 Unported License. Permissions beyond the scope of this license may be available at http://54.191.103.115.